Parametric computational experiments are becoming increasingly important in science and engineering as a means of exploring the behaviour of complex systems. For example, an engineer may explore the behaviour of a wing by running a computational model of the airfoil multiple times, while varying key parameters such as angle of attack and air speed. The results of these multiple experiments yield a picture of how the wing will behave in different parts of parametric space. The same process can be applied in other experiments that involve parametric modelling. Nimrod is a specialised parametric modelling system. It uses a simple declarative parametric modelling language to express a parametric experiment. It provides the machinery to automate the task of formulating, running, monitoring, collating, presenting and visualising the results from multiple individual experiments. Nimrod incorporates distributed scheduling so that the appropriate number and kind of resources to complete the job, e.g., HPC and virtual machines, can be selected and used. 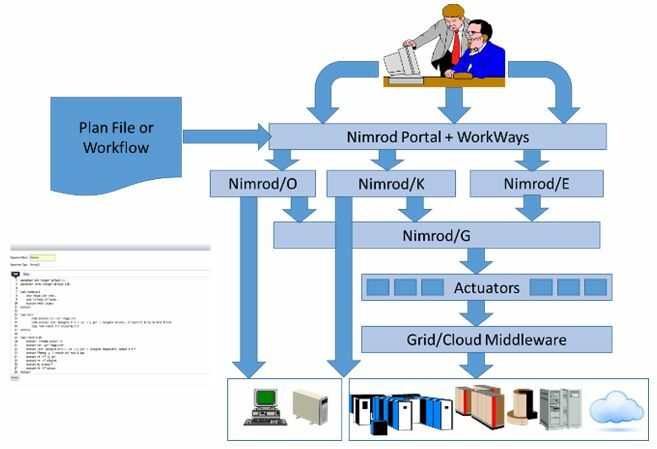 Nimrod helps researchers run computations remotely on the cloud. It can turn your laptop into a supercomputer. With Nirmod you can run many jobs — millions if need be. Nimrod-G is a tool for people to access the computational resources of the grid. Nimrod-K is a development platform that allows you to bring together your various computations, modeling, visualisation and storage to create a flow of work (i.e. a scientific workflow). More importantly, Nimrod-K enables the use of HPC and cloud resources for computationally expensive tasks in a workflow. It also enables you to share that workflow with collaborators and other researchers. Nimrod-O enables more refined searching across potentially millions of combinations of research parameters. Nimrod-E helps you work out what parameters are relevant to your experiment. The RCC provides training for all the Nimrod tools. To request training, contact our Nimrod expert, Minh Dinh, via email: m.dinh1@uq.edu.au.